I see exams to get certified in other specialties but ophth/optometry... But why??? Make sure AAPC will recognize them for CEU's or contact JCAHPO to see what they can do to help. I agree with you. 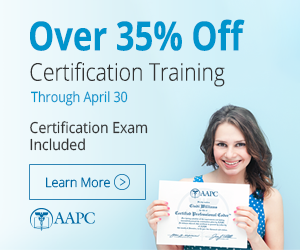 I think the AAPC should also offer its own specialty certification in Ophthalmology/Optometry. Hello - you're better to stick with the AAOE - they 'own' the eye codes (plus I think the test is open book!). There's more to ophthalmology than just eye codes. What about E/M single system exam? What about diagnostic tests? Minor and major surgery? AAPC should really offer something for us. update on CPC specialty exam? I was wondering if anyone had heard anything about AAPC offering an optometry/ophthalmology specialty certification in the near future? I know the AOA has a CPOC for optometry and the AAOE has an OCS for ophthalmology but it sure would be nice to have all my certs from the same body to avoid extra membership dues, CE costs, etc. Anybody have good news for me? Well, I think that unless there are enough voices united calling for it, the AAPC will not consider ophthalmology/optometry large enough to merit a separate certification. I currently have the OCS from JCAHPO/AAOE to supplement my CPC, but agree that having one organization to refer to would be much more convenient. OCS is ophthalmology, right? Thanks, I'll put that on my list after the CPOC optometry one since that is my current employment specialty. It's too bad because even though there may not be a lot of us, it's a pretty complex specialty and would be nice to be able to prove to prospective employers/clients that we are knowledgeable in the field. Maybe someday.